Blue jays harvest acorns from the treetops at this time of year. They may come to bird feeders, but acorns are their main food. A single blue jay like this one may store thousands of acorns in the woods by burying them one by one in the ground. The bird then finds them later and digs them up to eat. As traditional moon names like harvest moon and corn moon remind us, fall is harvest time – but not only for us. Our native blue jays are busy harvesting acorns in the woods. Have you seen them doing this? If not, one reason may be that blue jays (Cyanocitta cristata) tend to gather acorns in the treetops. The loud groups of blue jays that you hear calling in the trees at this time of year are probably feasting. Like squirrels, blue jays pull acorns off the branches, instead of waiting until they fall to the ground where they’re also eaten by chipmunks, wild turkeys, foxes, and deer. Blue jays also carry off acorns and store them for later. Blue jays prefer small acorns and can carry 5 at a time. How do they manage that? They fly with three in their throat, one in their mouth, and one in their bill. A blue jay will travel to a chosen spot on the ground, up to a mile and a half away from the oak tree. There it dumps the acorns in a pile and proceeds to bury them, one by one, in various places within about 10 feet of the pile. A single blue jay may hide 3,000 – 5,000 nuts in a season. If you’re going to hide your food, you’d better remember what you did with it. Fortunately, blue jays are pretty smart. Like other birds that hide and store food, such as chickadees and nuthatches, blue jays have brains that are bigger in the part that deals with memory. (It’s called the hippocampus, just like the similar part in our own brains). They come back and dig up their hidden acorns with their beaks. From October to March, acorns and other nuts make up an average of 65% of their diet. Of course, blue jays don’t find all of their buried acorns. Some acorns get left where blue jays planted them, and a few of those sprout and grow into new oak trees. In this way, by planting and forgetting some acorns, blue jays help to spread and regenerate forests. They may especially help to spread white oaks (the ones we recognize by the round lobes on their leaves), because squirrels tend to eat white oak acorns right away and to bury the acorns from black or red oaks (the ones with pointed lobes on their leaves). Why do squirrels do this? Apparently red or black oak acorns keep better than white oak acorns and are also harder to digest, due to higher tannin content. Blue jays, on the other hand, store all kinds. Blue jays are even sometimes credited with helping to bring back forests to areas like New England that were cleared by glaciers in the last ice age. Blue jays are well adapted for acorn-eating. They hold a nut with one foot and pound it with their beak, which works like a chisel to open it. Their lower jaw is set up to brace against their skull during this type of heavy-duty pecking. Besides acorns, which are their favorite fall food, blue jays also eat other nuts of our forests, such as beech nuts, hickory nuts, and hazelnuts. More than a century ago, when chestnut trees were common and even dominant in our forests, before the chestnut blight of the early 1900s, they also ate chestnuts. 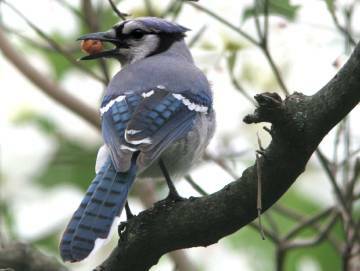 Blue jays also eat a wide-ranging diet of other foods, and this is one reason blue jays are so common. You may have had your best look at blue jays at a bird feeder, where they go for sunflower seeds and cracked corn, but they’ll also eat dog food. Insects are on their menu, including grasshoppers, cicadas, dragonflies, beetles, and butterflies, as well as berries and fruit. Blue jays are large enough to prey occasionally on small animals, such as bats and tree frogs. They’re mid-sized birds, about 11 inches long – bigger than robins but smaller than their relatives, the crows. And like squirrels, blue jays are notorious nest raiders. Yes, they’ll eat the eggs and chicks of other birds. Smaller birds often gang up and harass any blue jay that comes by, especially during the nesting season. This is something you might see if you notice a noisy flap going on among the birds in your yard. Blue jays themselves often mob and chase off bigger birds that pose a threat, such as owls and hawks. Their persistent “jaaay” call rallies other jays and even chickadees and nuthatches to the chase. If you hear these calls, look around for the hawk or owl or other animal that might be the reason for all the excitement. When they’re nesting, blue jays can be quite aggressive toward certain animals, such as squirrels and cats. They’ve even been known to dive at humans who venture too close to a nest, or to swoop and actually strike a person who comes over to peer at a nestling – dead or alive – that has fallen to the ground. Besides the “jaaay” call that gives them their name, blue jays make a wide variety of other sounds. You may have heard their bell-like “toodle-toodle” call without realizing it’s from a blue jay. They also make rattling sounds, and a noise that resembles a squeaky gate. They’re good at mimicking the calls of other birds, especially hawks. Blue jays pair for life. Males and females look alike, with a blue coat of feathers, white undersides, and a crest. They often nest in pine trees, such as the white pines that are as typical of our local woods as oaks are. Newly hatched blue jays are naked, giving rise to the expression, “naked as a jaybird.” Mates work together to raise and feed their young, which then may stay with the parents for a couple of months. But for most of the year, blue jays go in for group living. In the fall, family groups band together in large, noisy groups. As winter approaches, the large groups break up into smaller ones of 4-6 birds. Blue jays don’t defend territories but usually move around a range. Then, in late winter, you might notice large, raucous groups in the woods again. These are probably groups of younger, unpaired blue jays traveling together, as established pairs begin to go off on their own for the breeding season. It’s tempting to think of blue jays as bullies because of their size, loud groups, and aggressive ways toward other birds, especially around bird feeders, which bring together birds that don’t normally associate with one another in the wild. But blue jays are remarkable for their intelligence and adaptability. They can even learn by observation, a hallmark of intelligence in animals. Researchers noted that caged blue jays learned to choose to eat certain butterflies over others simply by watching what other blue jays in neighboring cages ate. Blue jays originally were – and still are – birds of the forest, found everywhere that oaks grow. Yet they have adapted well to the changes that humans have made to the landscape, as we’ve fragmented forests and produced plenty of “edge” environments alongside fields, lawns, parking lots, roads, and trails. Today blue jays live successfully in many areas, including suburbs and urban areas, and they enjoy the foods they find in agricultural fields, bird feeders, mulch piles, refuse, and yards with ornamental plantings. In spite of their success, blue jays may be somewhat less common than they used to be. The Mass Audubon Society notes in its 2011 State of the Birds report that long-term surveys show a gradual but steady decline in blue jays. Like robins and crows, blue jays are susceptible to the mosquito-borne West Nile virus. Most blue jays in our area are year-round residents, although some migrate. As the leaves turn color and drop, think of the acorn harvest and look forward to seeing blue jays in the bare branches of fall and winter.